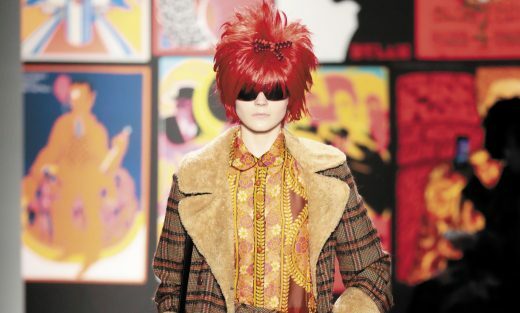 Anna Sui christened her FW19 collection “Poptimism,” taking guests at her runway show on a romp through the saturated secondary colours of early ’60s concert posters and tweely posh dress-up clothing.This Pop-optimistic mood was the latest in Sui’s multi-season journey to find a calm from the storm of the world. 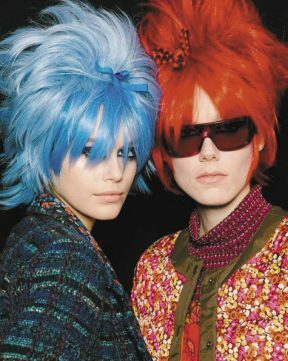 The other big colour story was Anna’s use of electric tones, taking centre stage through the clothing and eccentric wigs. 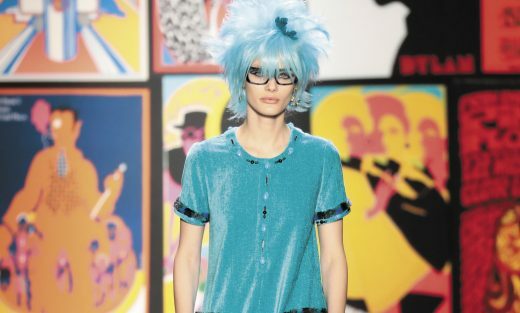 The punk-inspired wigs were paired with Anna’s statement eyewear, which are becoming a staple feature in her runway shows. Clean lines were key in the wraparound styles featured in this show. Sunglasses and optical frames in tones of dark burgundy, vivid blue and classic black tied the looks together, modelled by catwalk stars Kaia Gerber and Kiki Willems. Posted in The All Seeing Eye and tagged Anna Sui, collections, eyewear, Mondottica, NYFW.